There are many reasons to outsource your help desk support services, from providing expert service to having help available 24/7. Once you’ve made the decision to hire a third-party company to handle your technical support services, you’ll have to begin the search for the perfect company to do it. This can be a stressful task since you’ll be entrusting them to uphold the reputation of your company. 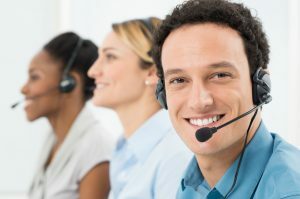 There are a few key things you should keep in mind when searching for outsourced help desk providers to make sure your customers receive the best service possible. Begin your search by identifying everything you expect from the agency you hire. Having a clear idea of what your business needs will help you narrow down your search and hopefully make your final decision easier. Customer support is the main goal of any call center, so you should ask prospective agencies to take a look at their data. Measurement of a vendor’s speed and problem resolution is valuable information that’ll be able to help you make an informed decision. Beware of those who only discuss the number of calls that they handle—more pertinent information is the number of satisfied customers they’ve been able to help. Remember to inquire about the experience of their staff. Don’t be hesitant to ask about their vetting process and how they verify credentials; these individuals, whether you see them face-to-face or not, will be handling your business and you’ll need to make sure that their performance is up to par. When you select an agency that you deem reputable and reliable, you’ll have to form a contract. When the agency provides you with their written agreement, be sure to look it over carefully and have a legal professional so the same. Seeking legal council will prevent you from getting locked into a questionable agreement—some outsourced help desk solution companies may increase their rates every year based on the volume of calls and catch you off guard with extra fees. Going over the fine print carefully will help you avoid making a deal you’ll be unsatisfied with in the future. Chances are your business will go through a myriad of changes ad it continues to grow, so you’ll want to select an outsourced help desk that will be able to grow with you. Choosing an agency that’s able to adapt to the shifts you’ll encounter is extremely important—you don’t want to have to switch providers in the midst of a growth spurt. Being able to deal with changes, and change with you as you grow is an imperative quality that you should look for when hiring and agency. If you’re looking for an outsourced technical support company that you can trust to provide your customers with unparalleled service, look no further than 3C Contact Services. We have a team of highly trained and experienced call center agents that will work to ensure your customers are well taken care of. Our services will not only maintain your current client base, but will work to expand it as well. Contact us today to learn more about how we can help grow your business!